The International Brazilian Jiu Jitsu Federation (IBJJF) World Championship is widely regarded as the most prestigious tournament in our sport’s calendar. 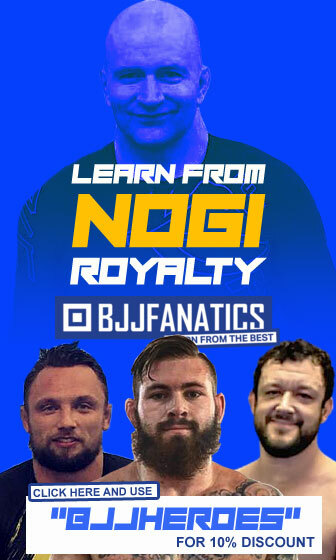 A competition that has historically gathered the very best in our sport, and a must have title to any athlete with legitimate aspirations of becoming ‘Jiu Jitsu’s Best’. With each passing season, new trends and technicalities are added to this ever growing sport, and the IBJJF Worlds (often referred to as the ‘Mundial’) is the ultimate proving ground for these additions. 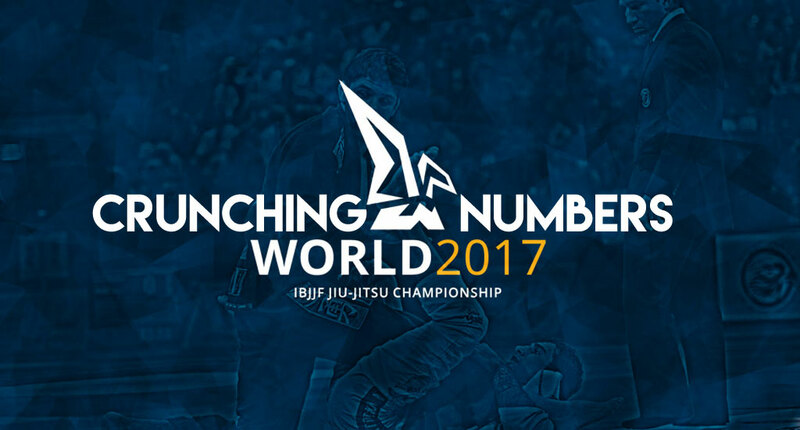 Keeping that in mind, we at BJJ Heroes have been following those same trends, starting in 2015 with our ‘Crunching Numbers’ articles (for the World Championships) and the ‘By The Numbers’ pieces for the IBJJF Pans. 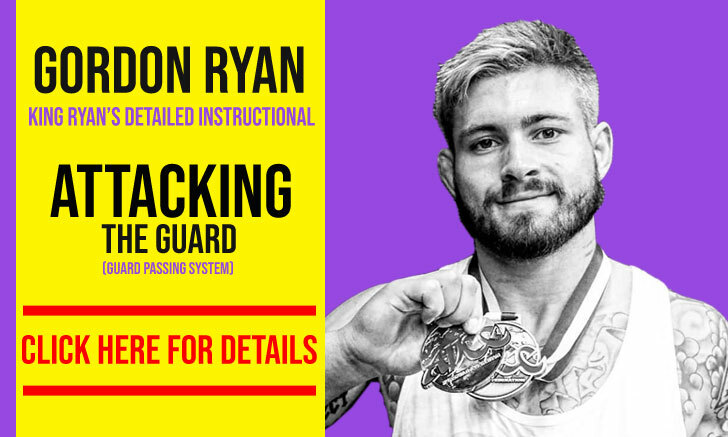 With these, we hope to provide deeper knowledge of grappling and the maneuvers being played at the highest level. This article here presented, regards last weekend’s World Jiu Jitsu Championship (2017). Although the female category’ has historically been considerably smaller in numbers of athletes when comparing to its male counterpart, it is rapidly developing in high-end talent. This year alone, we witnessed 5 newly promoted black belts earning their 1st world title in the division by beating seasoned veterans. Raising the competitive levels of each division has in return lowered the submission ratio in the women’s class, which now stands much closer to the men’s numbers, than in had in past events. Even though the 2017 Male Black Belt division did bring us more matches than it had in 2016, the submission ratio has maintained a very similar pattern. This means a continuous decrease in the number of submissions and subsequent lowered proportion in relation to years past. This low trend of victories by submission does not fall in line with our assessment of this year’s IBJJF Pan American Championships, where subs stood at 40% (more on that here), showing stable numbers in equivalence with past events. A logical explanation for these lower numbers in our submission count could be the inclusion of qualifiers by the federation. Since 2016 the IBJJF is no longer promoting its World Championship as an ‘open tournament’, having instead placed a cap on participants. 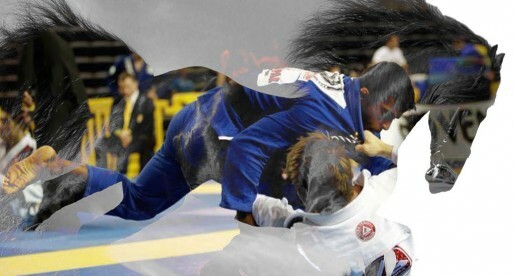 Athletes can only compete if they have gathered a certain amount of IBJJF points, accumulated through their victories while competing in the organisation’s league. This new stipulation has raised the level of the competitors in the Mundial, leaving very little room for part-timers or lesser skilled black belts. Higher competition tends to directly relate with elevated levels of difficulty when hunting for the finish. Although most competitors have their aims set on winning by submission, when competing at the highest level those finishes are hard to comeby. When the tap isn’t accomplished, the point system is there to outline a clear winner, removing from the equation the unforgiving burden of deciding the victor by decision. The fight for control of a match, and for out-positioning an opponent, generated a wide number of points on the scoreboards of the World Jiu Jitsu Championship this year. Between battling for takedowns, back takes, sweeps and guard passes, a total of 299 point awarding moves were accounted for between the Rooster and Ultra-Heavyweight divisions of the Male Black Belt category. 9 weight classes (open class not included). According to the data collected, this year was all about the sweeps. These took the overwhelming majority of point awarding moves, as seen on the chart below. But the buck doesn’t stop here. In assessing which guard positions were more fruitful in adding points to the score-board, another clear winner arises. The 50/50 Guard. NOTE: Often athletes transition between guards before hitting a desired sweep. In this assessment we chose the guard which initiated the point winning sequence. 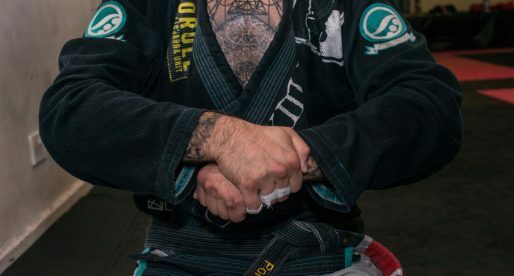 Once hated by old school competitors and many in our sport’s media, the 50/50 Guard has flourished in jiu jitsu’s competitive environment and is today used for a multitude of reasons. 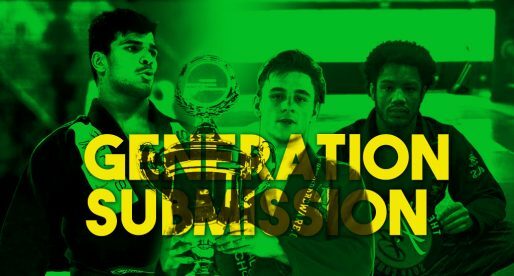 Be it to constrain the movement and agility in the lower weight classes; to obtain sweeping points, or as a path to the submission, something heavier weights such as Luiz Panza, Erberth Santos, Rodrigo Cavaca and Marcus Almeida do very well (although not exclusive to these, obviously). 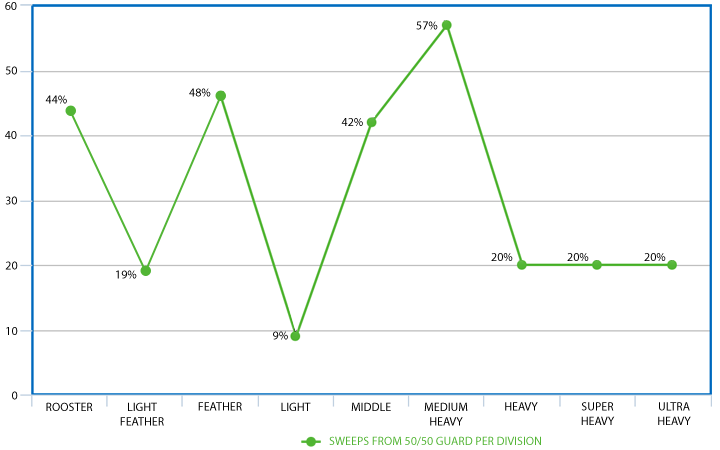 The following chart displays the rate in which the 50/50 Guard was used for sweeps in each weight class. The percentages shown relate to the total number of sweeps used per division. Coming second in number of point awarding instances was the guard pass. A hard trade, still holding very strong in our sport. One interesting aspect of the guard passing game is that although all weight classes showed decent numbers of passes, one category contradicted them all – the rooster-weights, which only saw one guard get passed. 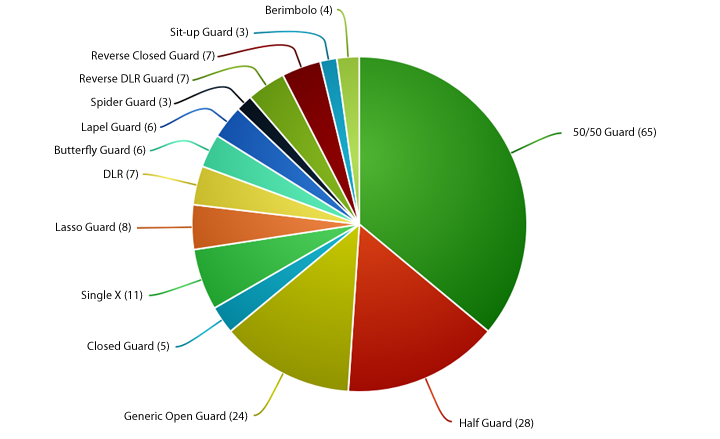 The highest rate of guard passes came from the middle and medium-heavyweight categories. 8 passes each. Below is a distribution of the various types of techniques used to conquer those important 3 points. A facet sometimes forgotten in our sport is the stand-up game. Although virtually dead in the lower weight classes of our sport, with only two (2) takedown occurrences between the rooster, light-feather and featherweight divisions, the takedowns start picking up as we get up to the heavier categories. Throughout the medium-heavy all the way towards the ultra-heavy, the takedown game gained up on importance and was indeed the deciding factor in many matches, ranging from 8-9 takedowns/throws per division. Another interesting aspect of the throwing game has been the decrease in takedown points from poorly calculated guard pulls. After 13 instances of missed guard-pull attempts last year, 2017 gave us only 5. If you’ve read any of our stats-articles in the past, these numbers relating to the Male Black Belt Division (rooster to ultra-heavyweight – excluding open class) will not come as a surprise to you. 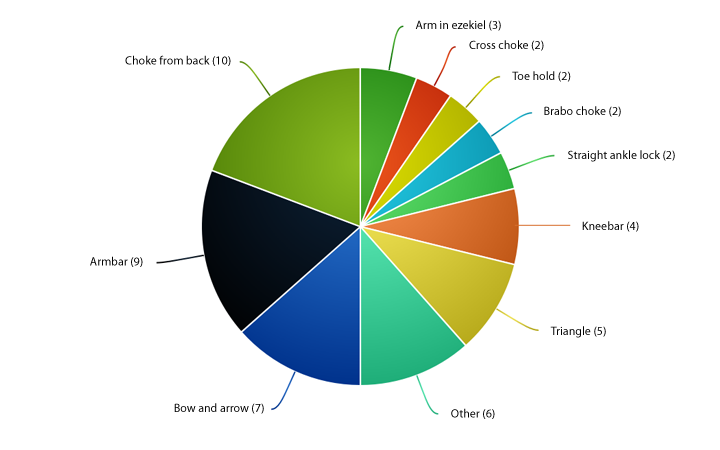 The slide in choke from back, and the armbar are still the most popular finishes at the highest level of jiu jitsu. A tendency that has held strong since we started our data collection practices. Maybe slightly more surprisingly is the decrease in lower limb submissions, something that had been growing in popularity over the past couple of years. And so we have it, the adult black belt division of the 2017 IBJJF World Championship dissected. 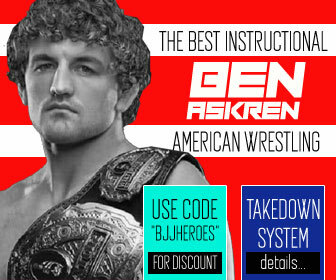 We hope you found the information useful and wish it can in some way help tweak your jiu jitsu. IBJJF Worlds Results: Meregali Beats Leandro Lo, Musumeci Becomes 4th US Champ! Can you be more specific when you talk about pressure passing and leg weaves? What do you mean exactly? If an explanation is not possible, it would be nice if you could refer the matches where those passes happened. 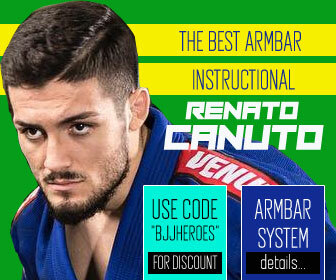 On each of these the arm bar part never specifies if it’s an arm bar from guard or from top. Big difference. Any way to get a clarification? The ‘points awarding moves’ graph, I’m assuming is how many instances of those points being scored, rather than the total number of points scored via those moves? Could you do this without pie charts. To quote every stats professor I have had, “pie charts are terrible”. (btw I am kidding about making you redo this). I am curious how you got your data? We collect the data ourselves, watching each match. First of all, thank you for the wonderful data. I am a Data Scientist and also practitioner of BJJ – currently a purple belt. Would you be kind enough to provide the data especially if you have multiyear data so I can perform some analysis of my own and also look for any type of interesting trends in the sport through the years? Thank you. THANKS we need more study like that !